This video was taken during Tiger Claw Media Dinner Gala Grandmasters Demonstration in 2012 in San Jose, California. You've seen how the Ip Man Movies have helped to spark the growth of Wing Chun Kung Fu worldwide. 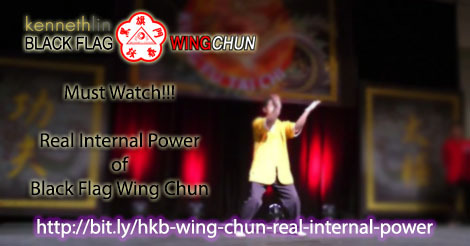 Now in this Wing Chun Video you will see a demonstration of Internal Power using HKB Eng Chun [Black Flag Wing Chun] to achieve the maximum efficiency of Time, Space and Energy. In this Wing Chun demonstration video, Grand Master Kenneth Lin demonstrates the internal power of Wing Chun to release Shock Impulse Power, also known as Hoat Keng / 發勁 [aka Fa jin or Faat Ging]. HKB Eng Chun [Black Flag Wing Chun] focuses on using the power of intent as its main source of power, rather than relying on structure as is power source like most other mainstream Wing Chun systems. This video was taken during Tiger Claw Media Dinner Gala Grand Masters Demonstration in 2012 in San Jose, California, where GM Lin demonstrated Four Different Kinds of Shocked Impulsed Power.